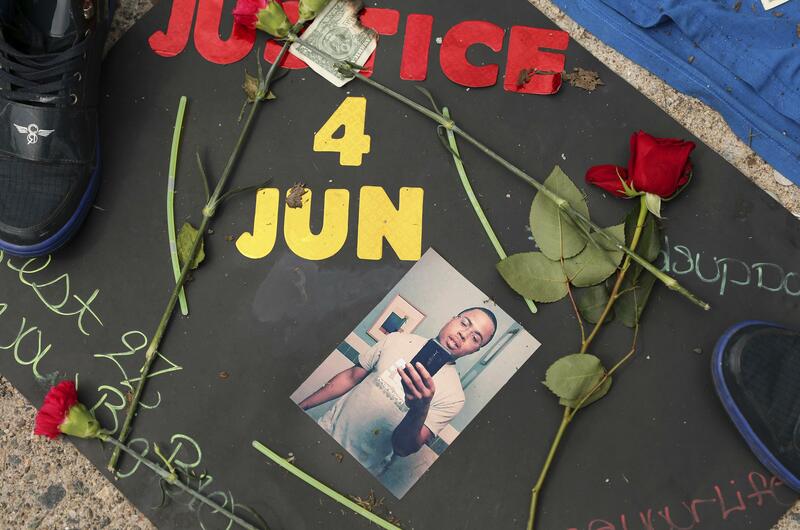 UPDATED: Mon., July 30, 2018, 11:11 a.m.
MINNEAPOLIS – Two Minneapolis police officers who shot and killed a black man were justified in using deadly force, a prosecutor announced Monday, saying the man was fleeing police and had turned toward them with a loaded gun before he was shot. “The decision to use deadly force against Mr. Blevins under those circumstances was authorized,” Freeman said. Freeman’s decision came after the city released the officers’ body-camera video late Sunday night. The announcement came by news release after he was shouted down at a news conference by community members where he had planned to detail the case. In a chase that takes less than a minute, Blevins yells back, “I didn’t do nothing bro,” `’Please don’t shoot” and “Leave me alone.” An enhanced version of the video has a red circle drawn around Blevins’ hand to highlight what appears to be a gun. At Freeman’s aborted news conference, Jeniffer Rohr, a friend of the Blevins family, criticized the officer heard saying “He’s got a gun” as their squad car rolled up to Blevins. “The officers deserve the Minneapolis Police Department’s highest award – the Medal of Honor – and the respect of the population it swore to protect,” Kroll said. The shooting was investigated by the Minnesota Bureau of Criminal Apprehension. Kroll said that the video showed Blevins fired his gun during the chase, and Freeman’s reported cited a bullet casing from Blevins’ gun found near his body. Some witnesses had disputed Blevins was armed, saying he was carrying a bottle or a cup. The video showed a bottle in Blevins’ hand. Blevins’ death prompted earlier demonstrations and community advocates demanded transparency and urged the swift release of body camera footage. Minneapolis Mayor Jacob Frey said it would be released after the Blevins family was consulted and the BCA had finished interviewing key witnesses. Kelly has been with the police department since 2013 and Schmidt joined in 2014. Both had served in the military and had been recognized numerous times for their work as police officers, according to redacted personnel files. They also both have had complaints against them. Kelly has had five complaints, all closed without discipline, while Schmidt has had three complaints against him, including two that were closed without discipline and one that remains open. Details about the complaints were not released. Published: July 30, 2018, 8:15 a.m. Updated: July 30, 2018, 11:11 a.m.